When: April 27th from 8:00 to 9:00 a.m.
Join us for our “It Takes A PRo” breakfast! As a skilled public relations professional, you know that your success depends on staying relevant, resourceful, and inspired. 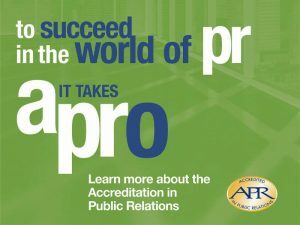 Discover what the Accreditation in Public Relations (APR) can do for your career and take the first step today bu join us for a free APR Breakfast Session to learn more. Already have your APR? Stop by and share your experience as part of the information session! Earning the APR provides the tools you need to refine your tactical skills and delve into the application of strategic thought— beyond everyday tasks—so you can deliver measurable results. The exposure to industry-wide standards and trends will assist you in moving forward confidently and competently in the demanding and dynamic PR and communications fields.